A huge colony of an elusive and brightly coloured shellfish species has been discovered in coastal waters in the west of Scotland. The extensive bed of at least 100 million flame shells was found during a survey of Loch Alsh, a sea inlet between Skye and the Scottish mainland. The Scottish environment secretary said it could be the largest grouping of flame shells anywhere in the world. The colony was uncovered during a survey commissioned by Marine Scotland. Flame shells build "nests" by binding gravel and shells together with thin wiry threads. About 4cm long, they group together in such numbers that the sea bed is covered by a felt-like organic reef of material several centimetres thick. 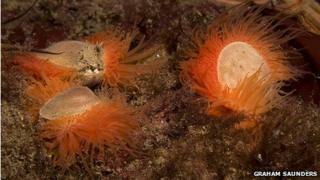 Flame shell beds are found at only eight sites in Scottish waters. It was conducted as part of work to identify new Marine Protected Areas (MPAs). The small, scallop-like species has numerous neon orange tentacles that emerge between the creatures' two shells. Flame shells group together on the sea bed and their nests create a living reef that supports hundreds of other species. The Loch Alsh flame shell reef is much larger than expected, covering an area of 75 hectares. Environment Secretary Richard Lochhead described the seas around Scotland as a "hotbed of biodiversity". "With Scottish waters covering an area around five-times bigger than our landmass, it's a huge challenge to try and understand more about our diverse and precious sea life," he said. "The flame shell must be considered among the most remarkable species in our waters, with a dazzling array of orange tentacles. "Many would place such an exotic species in far-flung tropical reefs - not realising they dwell under the waves just off the coast of Skye." He added: "This important discovery may be the largest grouping of flame shells anywhere in the world. "And not only are flame shells beautiful to look at, these enigmatic shellfish form a reef that offers a safe and productive environment for many other species." The Loch Alsh survey was carried out by Heriot-Watt University on behalf of Marine Scotland. Dan Harries, of Heriot-Watt University's School of Life Sciences, said: "Too often, when we go out to check earlier records of a particular species or habitat we find them damaged, struggling or even gone. "We are delighted that in this instance we found not just occasional patches but a huge and thriving flame shell community extending right the way along the entrance narrows of Loch Alsh. "This is a wonderful discovery for all concerned."